Some early concept art that was created for Lucasfilm's Solo: A Star Wars Story has surfaced and if you've ever wanted to know what a Wookiee Stormtrooper would look like, today's your lucky day! Turns out, we almost saw Wookiee Stormtroopers in Solo! In early drafts of the script, Wookiee slaves fought for the Empire, wearing stormtrooper armor into battle. They were specifically part of the Battle of Mimban. It's kind of a shame they never followed through with this concept because it's pretty cool! 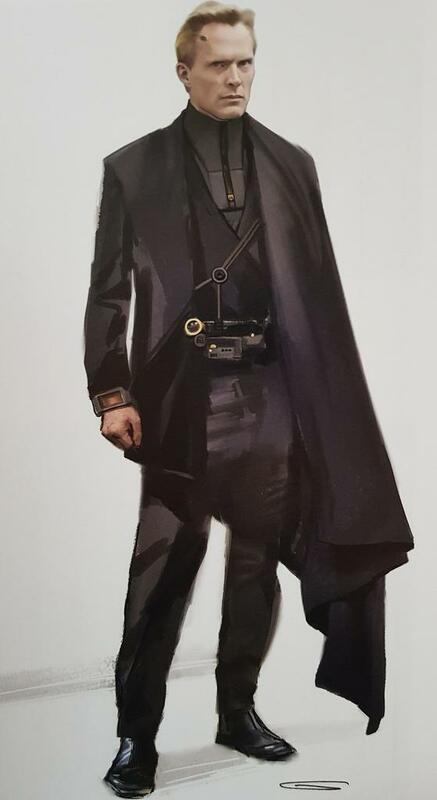 Thanks to ScreenRant you can see a couple pieces of concept art below, which comes from the new book, The Art of Solo: A Star Wars Story. Below these two photos, I get into the early versions of Dryden Vos. Before Paul Bettany came on board to take on the role of Dryden Vos, the character was played by Michael K. Williams (The Wire). They had to replace Williams because he wasn't able to come back for the reshoots. Williams' version of the villain would have been a completely CGI alien character and thanks to a series of concept art, we can see several different alien character designs. There's a wide range of them, one of them even includes a design that looks like Zeb from Star Wars Rebels. It looks like they flirted with the idea of making Vos the same alien race as Zeb. Check out all of the Dryden Vos concept designs below thanks to CBM. Which designs are your favorite?